I imagine that there's a crazy amount of pressure on a writer when it comes around to writing the final book in a series. You've built up a new and exciting world, created characters your readers fell in love with, and woven a compelling plot throughout the series--now what? You're left facing the enormous task of wrapping things up in a way that not only satisfies yourself but also satisfies your readers! Talk about pressure. 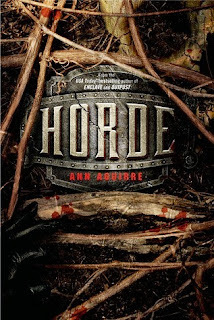 "Horde" was released toward the end of October, signaling the conclusion of Ann Aguirre's "Razorland" trilogy--and of Deuce and Fade's journey from the enclaves. Salvation is doomed. The monsters have surrounded the town, and there's no escape from the death and destruction the horde brings with them. But the odds have always been stacked against Deuce, and the Huntress in her won't let them get in the way of beating the Freaks, no matter what the cost. With her knives in her hand and her companions by her side, Deuce is determined to secure peace, even if it means pushing aside the nagging feeling that the monsters are somewhat human. This time, however, more than the fate of a single enclave or outpost is at stake. This time, Deuce carries the banner for the survival of all humanity. What I really enjoyed reading about in "Horde" was the character development of Deuce as the story progressed. Sure, she was always pretty badass from the start, but in "Outpost", the second book of the trilogy, you saw her get in touch with her more vulnerable side, the one that finds comfort and love in family. In "Horde", you see her grow as a leader as she faces the responsibilities of saving humanity. Despite the fact that she's only a mere sixteen-years old or so, Deuce has always been a mature heroine who has her feet firmly planted on the ground (except when she's swinging kicks at enemies, of course). Being a leader of an army, no matter how small at first, is no easy task, yet Deuce deals with it in a clever and levelheaded manner, and it's really admirable to see someone so young become someone that strong. In a similar thread, I also, of course, loved the development of Deuce and Fade's relationship in "Horde". Despite the whole issue with Fade having been kidnapped by the Freaks and stuff in "Outpost", their relationship grows in a way that only such hard circumstances can bring about. No matter what happens, they'll always find their way to each other. I just about died whenever they looked at each other and promise that they'll always be together. Just. Died. The other characters in "Horde" were interesting to read about as well, especially Stalker and Tegan, both of whom were part of Deuce and Fade's original group in the previous book. Stalker's unrequited love for Deuce was a little bit of a bummer, but what was more engaging was his struggle with his past actions when he was part of the gangs. Without giving too much away, I just feel like Stalker's the perfect tragic hero, and it was really interesting to see how his character developed throughout the novel. As for Tegan, what I found most exciting with her was how she strengthened both physically and emotionally, and through that shed the insecurities from her past and took on new responsibilities as a doctor to help others. Of course, you have Momma Oaks, Edmund and Rex, who adopted Deuce and showed her what being part of a family is, and their familial bond grows even stronger in "Horde", which was undeniably sweet to read about. A special mention also has to go out to Morrow, who I really enjoyed reading about! He's such an interesting and exciting character, and I really liked his role throughout the novel. Having said all of this, I do have to admit that I was pretty disappointed with the storyline of "Horde". This isn't to say that the events in the plot itself were boring--they were actually significant and allowed the characters to develop in new and engaging ways. Instead, it was the way that the storyline was conveyed to the readers that didn't really do it for me. I don't recall feeling the same way while reading the previous books, but I just felt like Ms. Aguirre's writing style was too passive and too descriptive to really capture the great action and emotion going on in the plot. It just seemed to downplay the sheer excitement of the battles and even the climax of the entire trilogy--it was over really quickly, and I felt like I'd missed out on something big. It made it kind of slow to read at times, as well, which is a huge shame considering how great the characters and the actual events of the storyline are! Overall, "Horde" is a fairly exciting finale to the "Razorland" trilogy, with a truly kickass heroine, an engaging cast of characters and a storyline that does a great job in tying everything together. What dimmed it down a little, however, was its overly passive and slow narrative. Nonetheless, it's definitely worth a read--it's an adventure that's both exciting and beautiful.